Navigation incident happened in Avachinskaya Bay is being actively debated by Russian and foreign media. Despite comments of Pacific Fleet Press Service, some federal news agencies give another tone to the case trying to blame submariners for the collision. So what really happened? 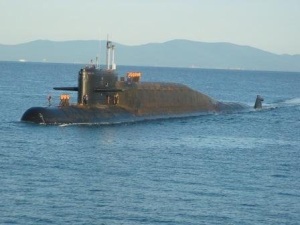 In accordance with Pacific Fleet Combat Training Plan, nuclear-powered ballistic missile submarine (SSBN) Svyatoi Georgy Pobedonosets was buoyed at surface position in the Mokhovaya Bay; the submarine was motionless, navigation lights were on. All kinds of defenses were organized, as well as permanent visual and radar monitoring. In a minute the seiner rammed to the submarine's portside. Anti-terror team onboard the sub was ready to use weapons. The seiner dropped astern as if it had recovered consciousness. People appeared on the deck and lights were switched on. Having examined boards of own ship, the seiner's crewmen left the deck in a couple of minutes, switched off all navigation lights and therefore created a background for new accident. Like a "Flying Dutchman" the seiner passed alongside the sub and speeded up. Despite attempts of submarine watchmen to call the seiner's crew on radio contact, Donets increased the speed and headed for the harbor exit. Submariners immediately conducted emergency inspection and reported about the incident. The harbor defense division command blocked navigation and roads off Mokhovaya Bay. Shipmaster of Donets was ordered to anchor in assigned point. At 02.40 am the seiner executed the command. In the morning inspection party boarded the seiner in order to examine its hull once again, check onboard documentation and question the crew. Marks of submarine's rubber coating were clearly seen on the ship's hull. Behavior of fishermen including the shipmaster was inadequate which was indicative of the liquor influence. The ship's documents were sealed. Being offered to sign protocol of incident, the shipmaster K. Gaidamovich gave flat denial. In accordance with legislation, the notary of Petropavlovsk-Kamchatski port was notified in written form about collision made by fishing seiner Donets towards SSBN Svyatoi Georgy Pobedonosets. The document notifies sea protest against actions of the seiner's shipmaster and Director General of JSC Rybnoye. Demand to compensate damage was claimed as well. Notifications of the incident were addressed to military judges of Petropavlovsk-Kamchatski and Viliuchinsk.